It’s our summit day, December 24th. We have to wait for the sun before we can begin climbing – it is too cold and windy to start in the dark, which I would normally prefer. Thus, we don’t get up until 6 am. After a feast of tea, Snickers and instant soup for breakfast, we take ropes, ice tools and other things we’ll need, and leave for the summit. The day is crisp, clear and less windy than the day before, which gives us confidence and makes for pleasanter climbing. As we climb over the Camp 2 plateau, we are faced with a question: where to go next? 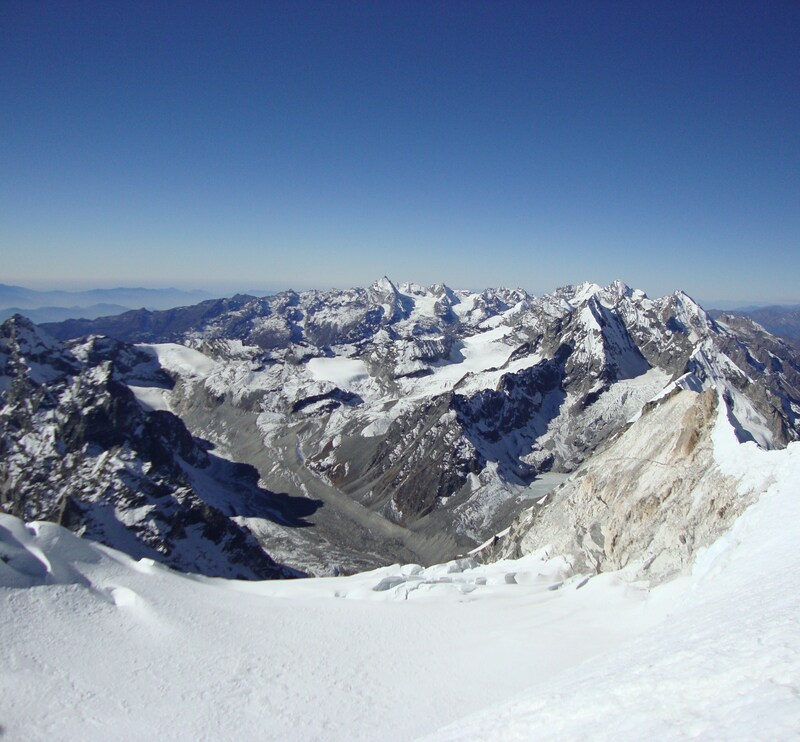 The most obvious and straightforward route, we agree, would be to climb a tall serac, cross the vast glacier towards the bergschrund and begin working up the steep South-East Face of the mountain. Yes, it will be a long day. ‘This is a minefield,’ I tell Dorje, as, roped up, the four of us cross the benign-looking glacier. ‘This place is all crevasses, probably, with a lot of movement in spring and fall.’ Our leader nods and smiles and, puffing like an old steam engine, I continue stumbling towards the bergschrund. We un-rope, and Pasang trots away, followed by Galden, to check the route and fix rope on its steepest sections – pretty much the whole of the South-East Face. Dorje stays behind, reminding me every so often to rest, and that ‘we’re in no rush’. I appreciate it that he never leaves my side. 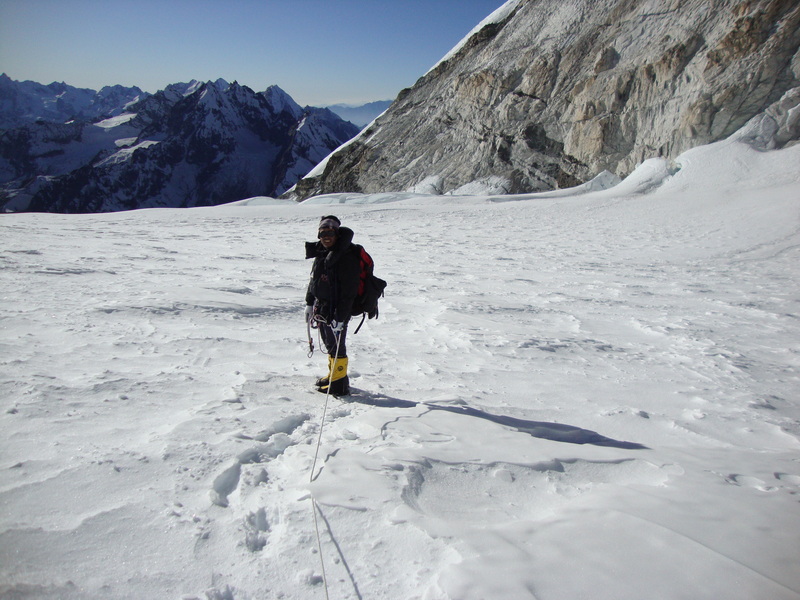 After negotiating – slowly and painfully – about 400 metres of fixed rope up the icy mountain face, there’s no more rope and no more ice ahead of me. Pasang and Galden are already smiling as is Dorje while I take a moment to realize that the four of us are on the summit of Ganchenpo. I feel… surprised, pleasantly surprised. The boys take pictures with the Nepali flag and my dazed and confused face against the gorgeous backdrop of the winter Himalaya; I reach for the Russian flag in my pocket and offer the camera my happiest smile, too. Then, I finally get a chance to look around. The summit is an over-hang of snow and ice, small and sharp, licked by loud winds. On the other side lies the mountain’s vertical West Face. The unkind-looking Langshisa Ri and Langtang Lirung, the site of death of the famous Tomas Humar, seem to be within reach; Ganesh Himal is slightly further away. ‘Chop-chop?’ Dorje suggests, pointing downwards; there seems to be nothing more to do. 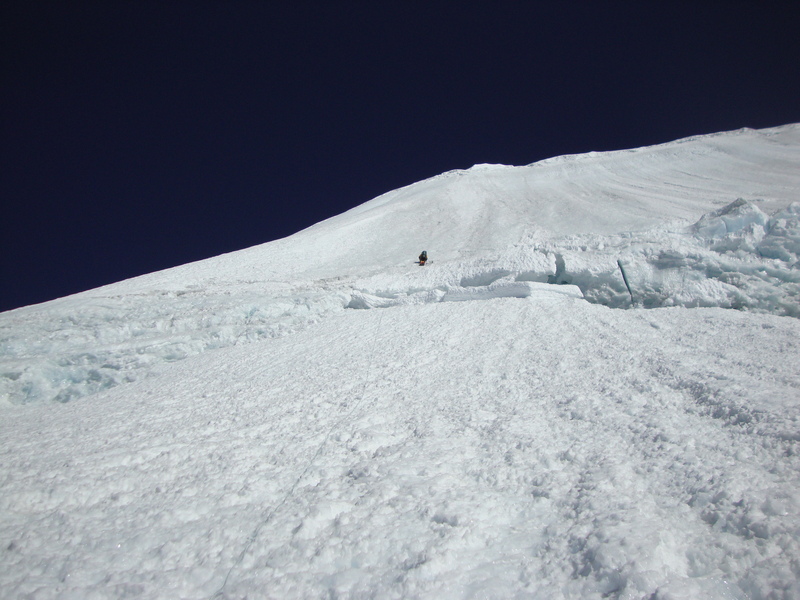 We’d taken just under 6 hours to get to the summit and will need at least 2 to get down to Camp 2. Given that it’s already 2 pm, that’s where we’ll be spending the night. We arrive, exhausted but happy, at the campsite which now feels like home, after 4 pm. Our Christmas dinner will consist of little more than instant soup, tea and biscuits but it will still be a big celebration for the team, and the summit – the best of presents. On Christmas morning I feel less than cheerful as for me it marks the beginning of the hardest day on the mountain – the descent to base camp. Although they call me Mila Sherpa, my team know that I am not their equal in strength; they always tease me about how I tend to ‘dance’ on boulders – get entangled in my own legs and fall – frequently. It is not a joke now because Ganchenpo’s steep slopes of winter ice would be almost impossible to self-arrest on with an ice-axe if I were to lose my step even once. Thus, they want to fix and re-fix what’s left of our ropes for me to rappel – all the way to the first snow-covered moraine. ‘You can’t do this. It’s a lot of rope to fix, a lot of time gone to waste,’ I say, trying to think of an alternative. ‘We’ve got rope and we’re in no rush,’ our leader replies in his calm, matter-of fact manner. With the decision made, the team works quickly and efficiently. On our way down we stop at Camp 1 to pick up the other tent and some other gear. Once off the snow, we change into trekking boots and retrace our route to base camp, ‘dancing’ ( me) on the boulders of the moraines and following the icy river. Soon, we spot the ‘kitchen’; before long we’re inside it, enjoying a hearty dinner, courtesy of Galden, and celebrating our safe return to base camp. Stopping overnight at Kyanjin Gompa and Lama Hotel, we return to Syphrubesi on December 28th and drive to Kathmandu early next morning. 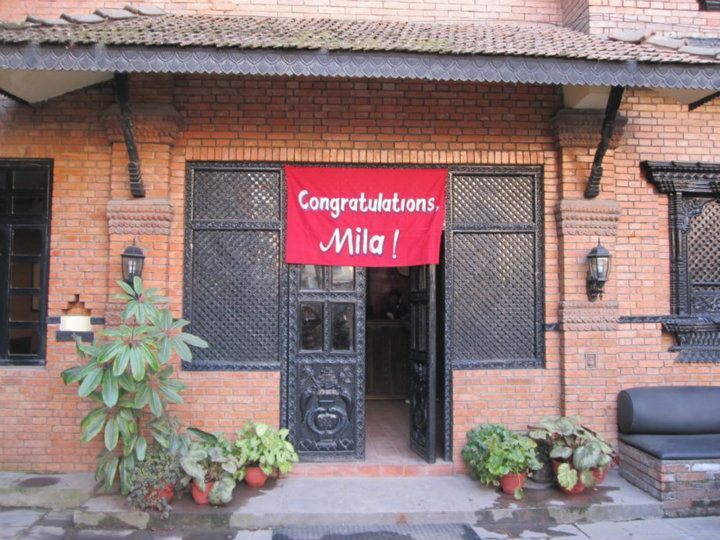 When we arrive at the hotel where I’ve been living all this time, I see a poster over the entrance with ‘Congratulations, Mila!’ written on it. I am deeply touched by my friends’ support and by the warmth with which they welcome me back home. I didn’t think there would be cause for celebration when I was leaving but my friends never doubted it. ‘It’s all thanks to them,’ – I tell the people gathered around the team, pointing at my boys. How do I express myself to make them understand that I am not being falsely modest when I say that it’s Dorje’s, Pasang’s, and Galden’s achievement? It was my team of supermen that dealt with every problem, which arose during our climb of Ganchenpo. Congratulations and many thanks to them! 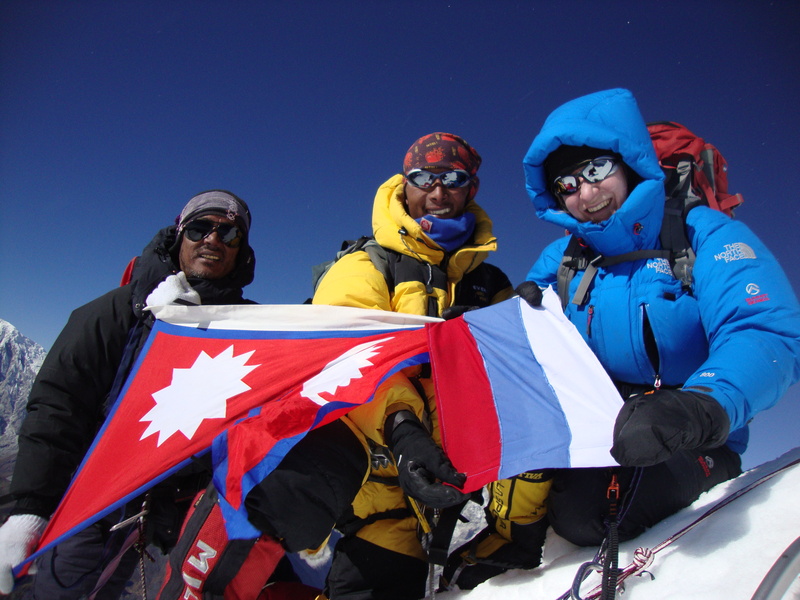 Edit: About a year after our winter expedition on Ganchenpo, which, we believed, was the first ever to reach the summit, I was informed that there had been a previous successful ascent. My sincerest apologies for unknowingly misleading my readers and congratulations to the true first ascent team! Ouuahh hi la loouu!!! What amazing girl you are!! 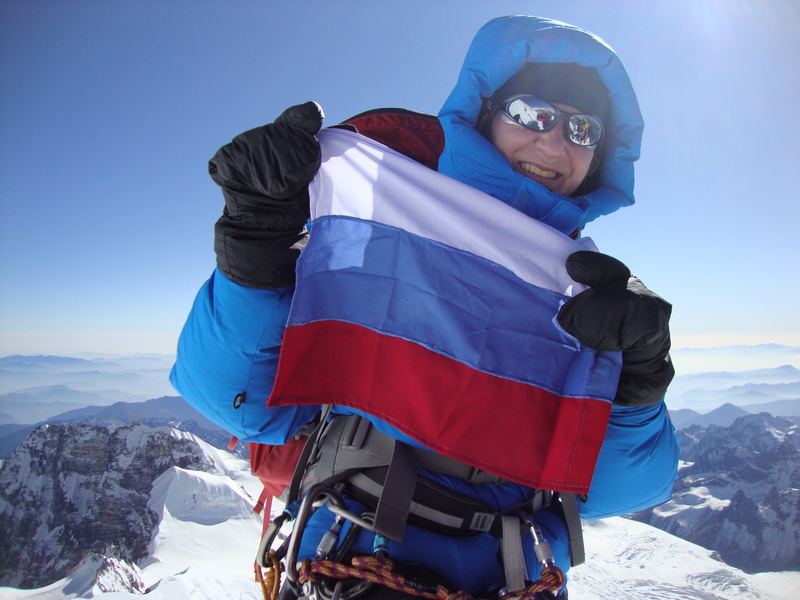 You look very nice with Russian flag at the top! Moreover I like you story very poetic you’ve got many string arch!! Look who’s here! Christophe, darling, thank you for reading! I think you will be pleased to hear that when I asked a tailor here in Thamel to make me a Russian flag, he offered me a French one instead ;). Although your team was wonderful, few would have been able or even willing to try what you did…do not underestimate your accomplishment…as Christopher said you’re “amazing” and an amazing writer also…cheers! It’s a great pleasure for me to know that you can relate to my experiences – which are often truly amazing – through my writing. Thank you for always reading :)! Came across this by chance after Googling ‘first ascent ganchenpo’, and thought hang on, this looks familiar! It’s a great read. I’m reading Tilman’s Nepal Himalaya at the moment. Tilman tried to climb Ganchenpo with Peter Lloyd and Tenzing Norgay in 1949. Although he called it Fluted Peak, by his description of location and altitude it was certainly Ganchenpo. Hi, Mark! Very flattered to see you here! Ganchenpo, according to the records in the official archives here in Nepal, had been unclimbed by any route until Dorjee, Pasang and I made the summit last winter. Officially, ours was recognized as the first ascent by any route. Thanks for the new nickname, too – Balls of Steel! Indeed, not many an internet poet can claim such an unusual pen name :)! I wouldn’t recommend using that one – might find you end up getting the wrong kind of reader! We checked with both Ms Hawley and NMA, and found no official ascents prior to ours. I don’t think there’s an online database, and NMA’s records are, perhaps, less detailed than one might like. Tilman should have taken me or some other dead-weight mountaineering buddy with him instead of a climbing pro. Sometimes it’s a good thing to slow down and consider the less obvious route options. He was past his prime then, and in any case it sounds like a simple pair of crampons would have done the job. He eventually turned around because he decided he decided over a thousand feet of step cutting was beyond them. I don’t know about dead-weight, Mila – you’re a bit too quick for me, and I’m sure you were able to slow down Dorje with a few extra cigarette packets while Pasang Wongchu went up to fix the rope!